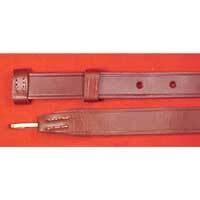 Authentic, U.S. made slings of oiled, 3/16" thick leather equipped with solid brass retainer. Russet brown color. Made to fit the 3-band Enfields.